Well it’s over at last, 50,122 words verified by NaNoWriMo and I’m exhausted, mostly due to getting up an hour and half earlier than usual every day to slog out some words before work. 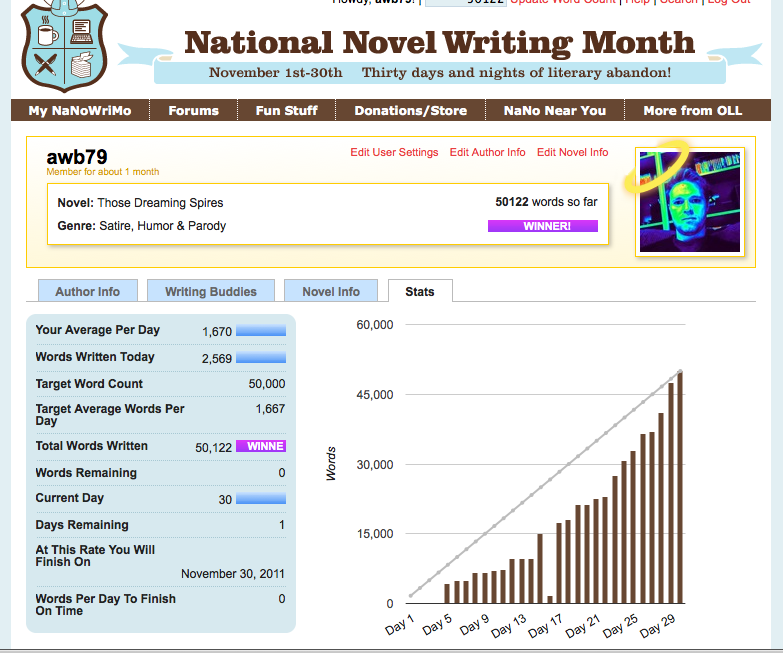 The anomaly on day 16, when the word count dropped to 1,704 was a mistake, I was aiming for 17,040 but hit return before hitting ‘0’ in a fit of NaNoWriMo-based excitement – the word count and stats were the only thing that got me through this. It was a fantastic experience and quite a marathon, towards the end, when everything was looking a tad bleak, I was aiming for 500 words before work, 500 on the bus to work, another 500 over lunch, 500 on the bus home and then 500 in the evenings. The organisers of NaNoWriMo hold another event in April called Script Frenzy which is a script writing equivalent of NaNoWriMo, 100 scripted pages of the script of your choice, I will definitely be entering in April. I may try to write a play, like the novelling, it’s something I’ve wanted to try for a few years but never had a spare month to commit. Anyway, that’s enough cyber-self-backslapping for one month.